The Piece Hall in Halifax is one of the most breathtaking buildings you could ever wish to walk in to. It’s Europe’s last remaining open-air cloth hall, and it resides in my home town! 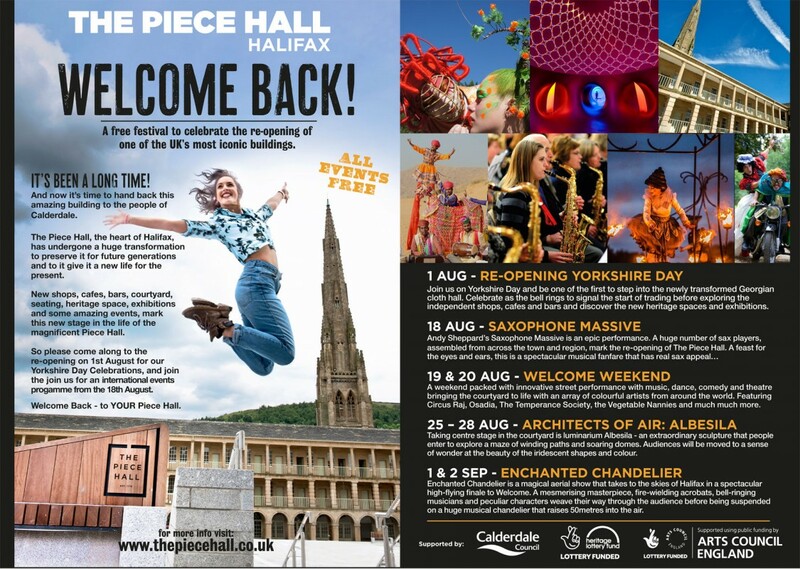 In 2014 The Piece Hall closed its doors to the public for a £20 million renovation. It was only meant to take a year or so, but when you start digging up a Grade 1 listed Georgian building, you tend to find it’s in a lot worse than you expected. SO it was 3 years later, on the 1st August (aptly, Yorkshire Day) that the building was reopened to the public after an incredible facelift. 26,000 people came through the immense gates that day, and there were bands, performances, food stalls, speeches and an incredible boost for the town. Following on from that was a schedule of events that brought together some incredible acts from around the globe. 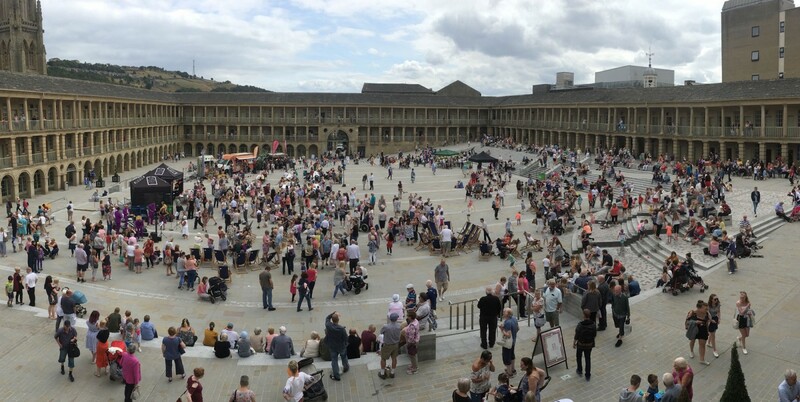 The whole thing came together to really hand The Piece Hall back to the people of Halifax and Yorkshire. 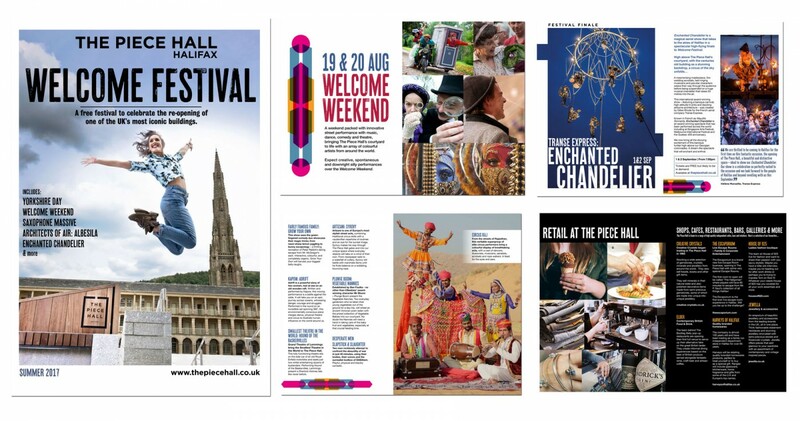 I was asked by The Piece Hall Trust & The CEO, Nicky Chance Thompson, to work on the opening campaign, marketing and branding, to pull together the launch day and bringing a narrative to the place in time for and after the reopening. It was an intense period of work to create the vast amount of material needed to engage locals and visitors from much further afield. I brought in photographers and illustrators, create a brand proposition, work on advertising material, brochures, signage, video and more. After the reopening period, I continued working on event campaigns, brands for restaurants, signage, digital displays, the Christmas Spectacular campaign of events and more. 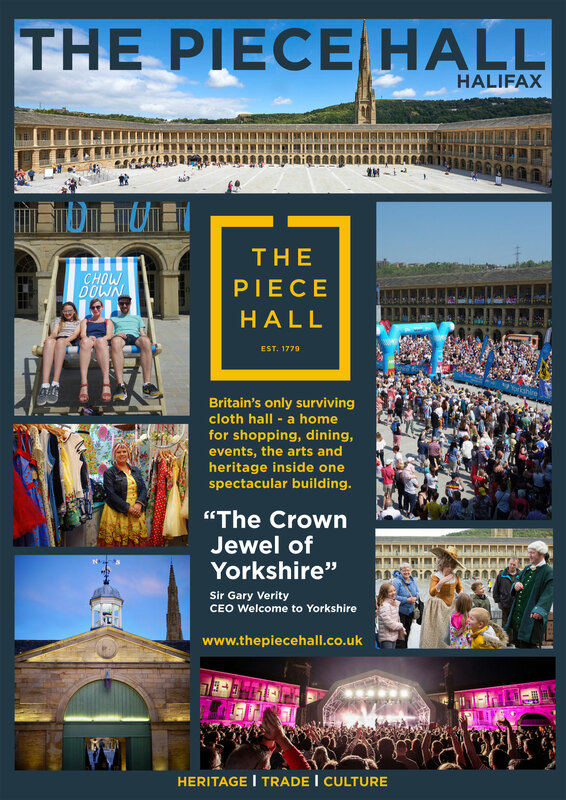 In the 12 months after opening, over 2.4 million visitors have visited The Piece Hall, enjoyed the architecture, displays, events and superb independent shops that fill the units around the colonnades. It really is amazing. 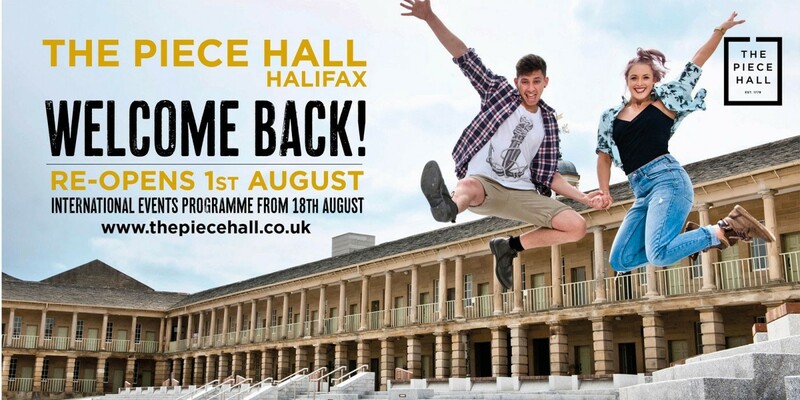 The team at The Piece Hall were great to work with, and I feel a real sense of privilege to be involved in such an important building, one that has huge economic and psychological impact for Halifax. 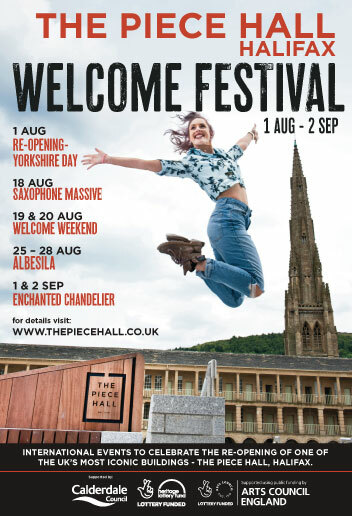 It has raised ambition in the town to a new level, and a new energy has emanated across the town and the Borough of Calderdale. Designs for the re-opening of The Piece Hall. Includes copywriting, art direction, commissioning photography, design, event commissioning, bringing in local producers for the opening day, signage, press ads, social media and more. The Trading Rooms Restaurant, Café & Bar, plus The Piece Hall Bakery. Both owned by The Piece Hall Trust. I used old images from The Piece Hall’s past when it was a fruit & veg market, as part of the brand. 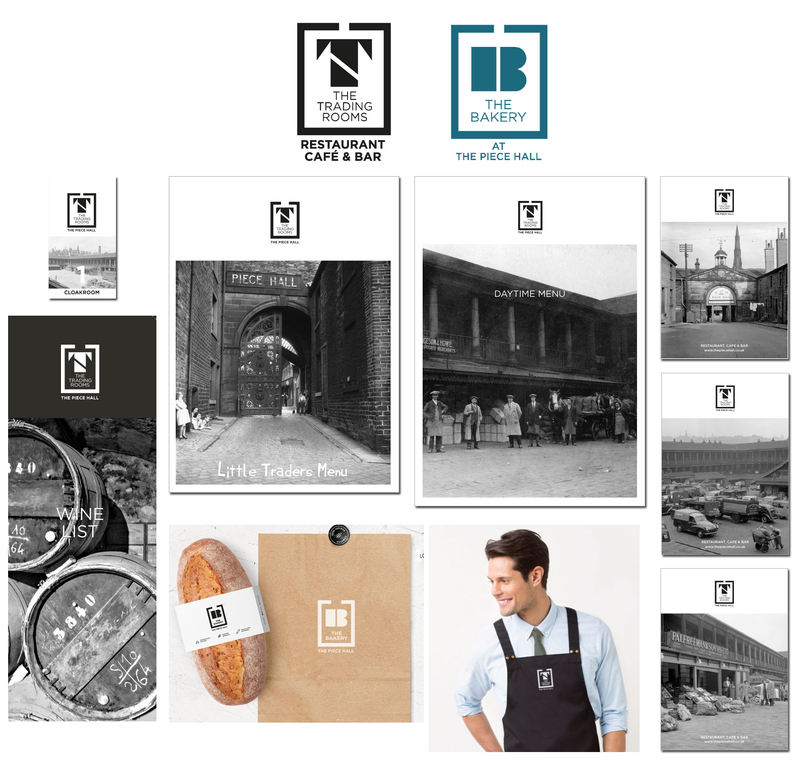 This was to show another part of The Piece Hall’s history as a place for trading.Branding went across signage, menus, uniforms, stationery & more. 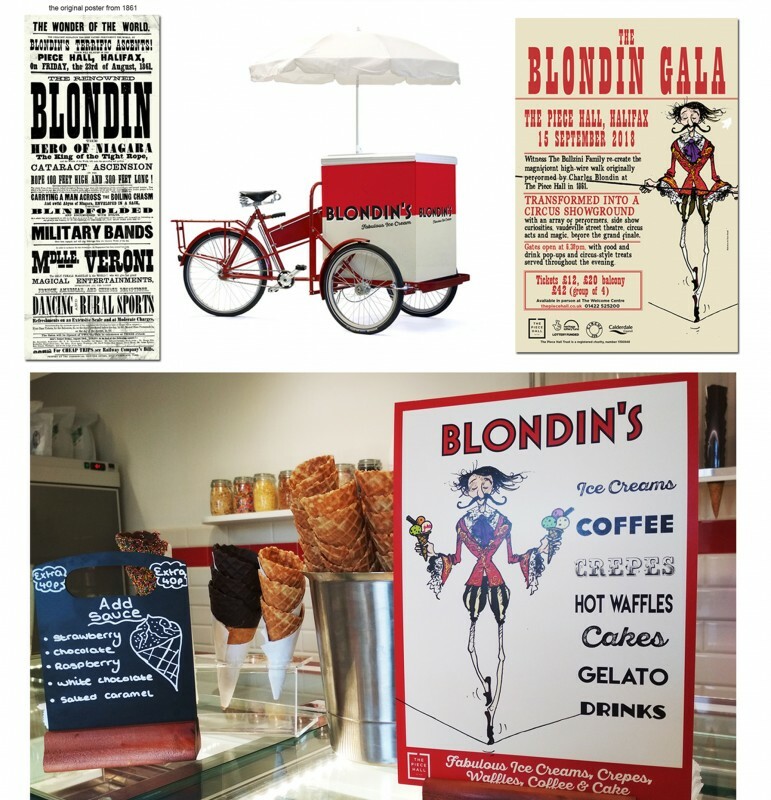 Branding for BLONDIN’s Ice Cream Parlour owned by The Piece Hall Trust. 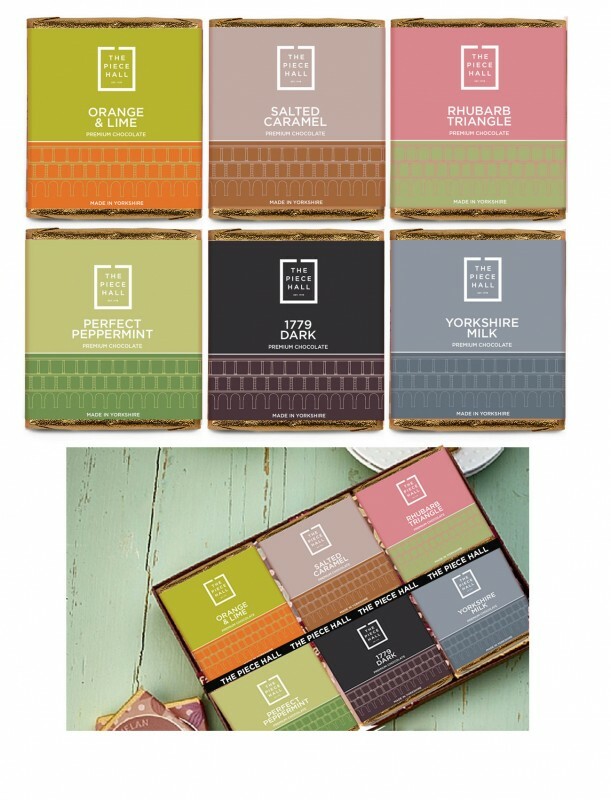 The name came from the famous tightrope walker Blondin, who traversed The Piece Hall in 1861. I commissioned well known illustrator Chris Mould who’s studio is in Halifax, to create the image of Blondin for the parlour. It was later used for The Blondin’s Gala, a recreation of the tightrope walk. 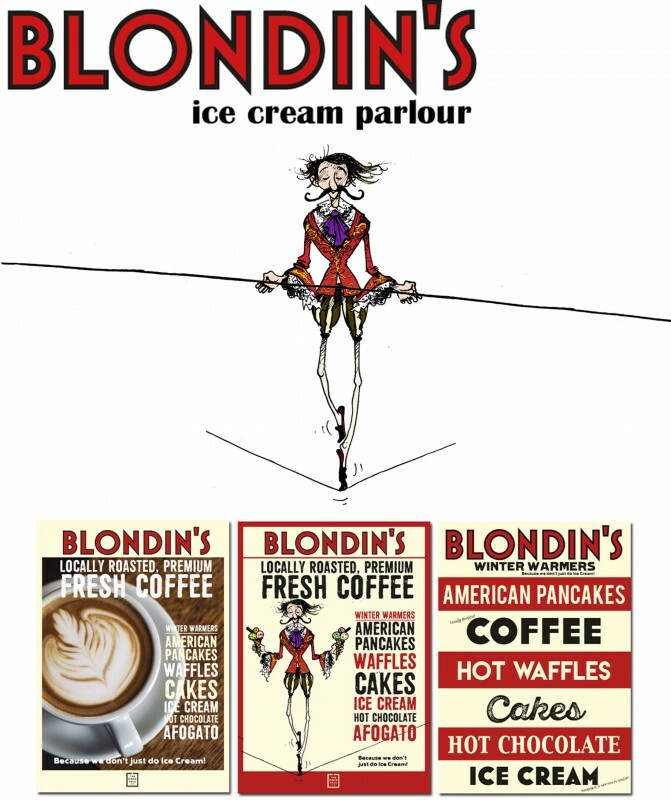 I based the designs on a cross between a traditional Italian Ice Cream Parlour & the original Blondins poster from 1861 (shown here).